genuine forms of nomadic, rural and urban lifestyles. Phenomenal vernacular architecture in this realm of diversity, appears to be the spirit of its ancient varied languages and sweet dialects, which flows through the turquoise color on tiles and the arabesque pattern on stuccoes. From crowded bazaars to tranquility in gardens, from vivid colors of flowers to relieving designs of carpets, from cool breeze up on mountains to the most scorching sands in deserts, IRAN is full of excitation, enthusiasm, marvel and fulfilled curiosity. In this domain of poetry and virtue, road cliffs have inscriptions on and palace walls have delicate paintings within. Travelers walk through footsteps of the kings and emperors from olden days and experience the host and livelihood of today’s people. Through our A Thousand and one journeys, honorably you are invited to the country of A Thousand and one Nights to be hosted in A thousand and one hosting traditions. As the second-largest Middle Eastern country and located in north of Persian Gulf and Sea of Oman, neighboring Armenia, Turkey, Azerbaijan Iraq, Turkmenistan, Afghanistan and Pakistan, IRAN is the world’s 17th-most-populous country with population of over 78 million. Tehran, as country’s capital since late 16th century, has grown to become lran’s largest city, as well as its cultural and economic center, home to approximately one-sixth of IRAN’s population. Other Iranian populous cities are Mashhad, Isfahan, Tabriz, Shiraz and Ahvaz which are also counted as country’s tour- ism highlights. IRAN today, attracts many travelers with different goals and interests and since there are still lots of potentials and attractions left little known even to Iranians, it might be one of most gratifying destinations for any tourist. This site intrigues you to explore the history, nature, culture and art of this country. Pictograms and petroglyphs, archeological urban settlements, ancient surgical instruments and world’s earliest known writing, all indicate thousand years of human presence in this land which adds up to the historic value of country and attracts more and more archeologists and history lovers every day. With more than 7000 years of history, lran is known to be one of world’s early civilizations and world’s largest empire during Achaemenid’s reign (550-330 BC), it has been invaded by many nations and great powers through centuries. Invasion of Arabs in AD 633 caused the replacement of Zoroastrian religion by lslam and what followed for hundreds of years after, was the disintegration of one empire and birth of another until 1979, when the revolution brought IRAN’s last royal kingdom, Pahlavi’s, to its end and formed the current government of Islamic republic. Among innumerable monuments and antiquities in lran, there are 22 UNESCO World Heritage sites (as of September 2017) as listed below, which represent art, architecture and history of country’s different eras. With its multiplicity of ethnic identities, IRAN is home to wide variety of customs, crafts, folk music, dances, rituals, traditions, religions and beliefs which are all categorized as intangible cultural heritages. From very earliest earthenware to contemporary artworks, all poems, paintings, calligraphies and crafts (such as wood carving, inlays, enamels, marquetry, etc.) are inspired by the artists’ surrounding nature and with accordance to country’s historical background and have taken form in geometric shapes and complex floral patterns through all ebbs and flows in time Among which, the best world-known representative could be Persian Carpet. Iranian architecture also serves as a reason to consider every city and town as a museum which reveals art of varied dynasties that have ruled during the past millennia. Not only the art pieces which are demonstrated in museums and galleries attract many visitors each year, but also do the workshops where these handicrafts are created. Sitting at the junction of three major tectonic plates, the Arabian, Eurasian and African, IRAN’s geography consists of a plateau surrounded by Alborz and Zagros mountain chains the geological folds which have caused country’s diverse climate. IRAN’s vast deserts which are listed among world’s driest places, Loot and Kavir, are only 5 hours away from Middle East’s tallest mountain, Damavand. With an area of 1,648,000 sq. km, lran has varied climatic regions from Alpine tops to semitropical mangroves and from large dense forests to dry salt lakes. This landscapes are habitat of exhilarating biodiversity with 194 species of mammals, over 530 bird species and about 8000 plant taxa. Regarding such remarkable flora and fauna, there are 28 national parks and 166 protected areas in IRAN. Although Persian rugs and carpets with their intricate woven patterns are believed to be lran’s most famous souvenir, there are many other amazing collectables and handicrafts to take home with you. With comestibles ranging from sweets and pastries such as Gaaz and Sohan to spices nuts and dry fruits, lran is known as world’s leading producer of Pistachio and Saffron. There are also variety of decorative arts in form of crafts, tiles and textiles. You may choose a vase of Meenakari (copper, silver or painted enamel) or an inlay (khatam) jewelry box. Besides, each city has its local hand woven cloths such as Termeh in Yazd, Qalamkar (Textile printing) in lsfahan , Kilim in Shiraz, Zarbaft (Brocade) in Kashan, etc. Just take your time visiting shopping areas and bazaars to discover the best gifts for your friends and families or perfect mementos from your trip to lran. Being diverse and distinct in different regions, almost every meal in lran is accompanied by bread and/or rice. Obviously each city has its regional cuisine according to locally available ingredients, most of which you will have the opportunity to try in our package tours. Still, read on to find out about the most favorite and easier-to-find Iranian dishes. Kabab Koobideh: grind mutton, breadcrumbs and onion ground together. You probably come across many other of names in your menu however, they are usually a combination of above-mentioned Kebabs, having their basis in these main types. Most restaurants serve varieties of Khoresht (meaty stew with vegetables) among which Ghormeh Sabzi (green mix of diced meat, beans and vegetables), Gheimeh (consisting of meat, tomatoes, split peas, onion and dried lime), Karafs (means celery in Persian) and Fesenjan (sauce of Pomegranate juice, walnut, and roast chicken) are Persian classics and the most favorites. Hair must be covered, necessarily not with a tight scarf as it’s common to leave some parts un- covered or your hair strands out of your loose shawl. Besides you need to cover your upper body with a long-sleeved and loose clothe down to your mid-thigh. Your legs are required to be covered down to ankles. It’s alright to wear tight jeans, sandals, high heels or colorful clothes. The only forbiddance is short pants, too short-sleeved or tight shirts. Although all non-Iranians would need a visa to visit IRAN, getting it is not difficult as in common misconception. It’s better to arrange a visa in advance or you take a risk on getting a 30-day visa upon arrival at the airport. US, UK and Canada citizens need to pre-arrange a tour or private guide, or a sponsor who takes legal responsibility for them. Consider that lsraeli passport holders or any other traveler with lsraeli stamp in their passports are not allowed into lran. Some of incoming tour operators in ran (such as Keyhan Travel) provide visa services included in their package tours which almost always ends in approved visa application in just a few days. In case you’re going to do it yourself, you can go directly to Inan consulate or embassy in your home country, fill the form and go through the rest of process which takes at least three weeks and often longer. Issued for five to seven days, you need to enter and exit via different countries, while having a visa or ticket to an onward country. With the same process as getting a tourist visa yourself, you must obtain an invitation letter from the company you plan to visit. Whether by plane, by train from Turkey, or across border of numerous neighboring countries, it’s not difficult to get into lran. Although getting a domestic ticket from outside lran is difficult, when entered the country, services on most forms of public transportation is frequent and getting around is comfortably accessible. Whether in form of FIT or group, in our tailor-made itineraries we could arrange for you to travel in disposal vehicles (sedan, suv van or coach) or by public means of transportation such as train, bus or plane according to your preferences. with Persian (Farsi) known as IRAN’s official polycentric language, there is wide range of languages and dialects spoken in this country among which Azeri Turkish), Kurdish, Luri, Gilaki, Mazandarani and Balochi are on top of the list by number of speakers. Farsi is written and read from right to left and its grammar is similar to that of many contemporary European languages. With approximately 110 million speakers worldwide, Farsi holds official status in IRAN, Tajikistan and Afghanistan. Although IRAN has several mobile networks, two government-owned ones are MCI and MTNIrancell with the widest coverage and pay-as-you-go SlM cards which are the most appropriate options for non-residents and travelers. Irancell SIMs allow 4G LTE data transfer and are purchasable with your passport however, down- load speed may not be as fast as you expect. IRAN is a cash economy for foreign travelers. Although there are functioning network of ATMs which can be used with locally issued bank cards, international credit cards and traveler cheques are not accepted. The official unit of currency is the lranian Rial (IRR) but people always talk in terms of Toman, which is equal to 10 Rials. So for example: 10,000 Rials, is equal to 1,000 Toman. Apart from some hotels, souvenir shops and travel agencies where you can pay in Euros or US Dollars, all transactions are in Rials. To answer its call, you’d better arrange your trip sometime between late March and early June. Whether on top of the highest mountains or between dry dunes, during this time you will experience the best weather condition almost everywhere. If you lost this spectacular time of year for any reason, then plan for autumn, as it’s the blossoms in the spring that become fruits in autumn! With probable chance of rain here or there, it’s the best time to walk through desert sands or colorful forests. Known as a four-season country, after all it’d be your intention which indicates your travel time case you’re a ski fan, choose winter; as a birdwatcher plan to come during autumn; if interested in alpinism don’t miss summertime and as summer leaves, it’s the right time to find nomads on their ranch to warmer climes. as the province of Fars of which the ancient city of Shiraz with its tombs of great poets of the past is the capital. Islamic architecture, which initiated many of the principals followed by other medieval architects, can be seen every where particularly in Esfahan, another ancient city of IRAN, which is also in central Persia. A visit to IRAN will open up a new world of ancient culture which for the past decade has been virtually closed to casual tourists. A trip to this country will evoke reminiscence of the ancient world of Persia in which the giants of past history lived amid untold splendor. “Art” From the moment, some 3000 years ago when an ingenious artist shaped and painted the magnificent bridge spouted vessels at Tepe Sialk To the time when master craftsmen carved the famous Achaemenian relief s at Persepolis and on into the Islamic era when sophisticated glassware and ceramics were made in the kilns of Ray, Gorgan and Nishapur. 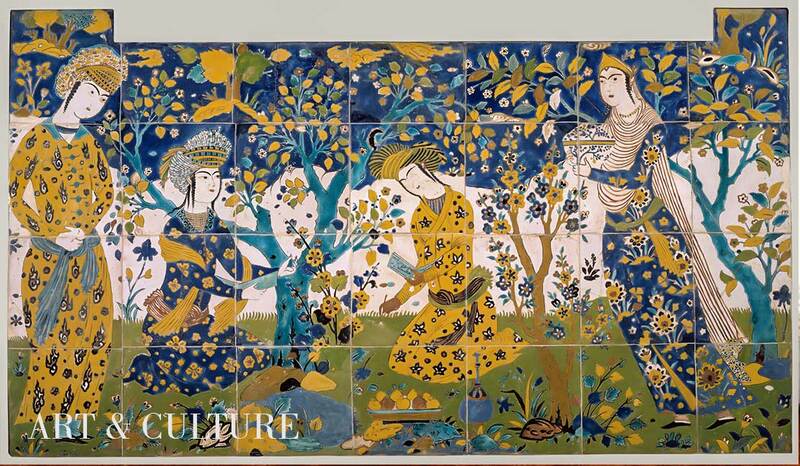 Art has become an inseparable part of Iranian life. One just has to stand before the intricately designed Ardabil carpet, woven for the shrine of Sheikh Saffied- din, to appreciate that. This artistic tradition, resulting in the creation of numerous objects of extraordinary beauty, has meant that most of today’s Iranian cities boast at least one museum. However, the capital, Tehran, is particularly rich in this respect, allowing the traveler to IRAN to begin or end his visit with a tour of very fine collections. “Geography” IRAN is a huge country of 1.648.000 square Kilometers with varying Eco System From the tropical Caspian shore with its rice and tea plantations, to the oilfields and sugar cane fields of Khuzestan, from the orchards and wheat fields of the province of Azerbaijan, to the deserts of Kavir and Lut with their oasis towns, from the central arid plateau, to the snowcapped Zagros and Alburz mountains IRAN is a land of extraordinary contrasts. The monuments are cold in the winter, the deserts hot in the summer, yet in spring and autumn there is no more beautiful a place on earth. Carpets of wild flowers are everywhere, little villages extend a shy welcome. This truly is God’s own land. “Music Persian classic music dates back to fifth century B.C. The Achaemenid’s Empire used music in prayer, royal festivities, national ceremonies, and war. One can compare traditional Persian music to the classical music of the West, which one should listen to from the beginning to the end with full attention. This form of Iranian music is based on improvisation and has a very inward quality. The sentiments of Persian music are personal and introspective .Compared to the west, the traditional instruments of IRAN are small and soft-sounding. “History” And IRAN was there in the beginning, in habited by civilizations great and small, each leaving a deep impression on the land and its people. 9000 years old. mounds of the plain of Khuzestan, ancient mounds of central, northwestern and northeastern, as well as central IRAN, are but a few of such examples. Modern IRAN offers a chance to visit the ancient mounds across the country, monuments such as the largest remaining Ziggurat in the world, that of Chogha Zanbil from the 13th century BC, the greatest architectural achievement of the first Persian Empire, Persepolis, from the 9th century BC, remains of monuments from the second Persian Empire, and a host of world class monuments from the Islamic era, reaching its zenith in Safavid Isfahan. “Persian Dishes” Spanning three thousand years, the cui- sine of Persia is one of the oldest in the world. It has the remarkable ability to absorb and adapt the foods of other nations, starting from ancient Rome & Greece, to Mogul, India, the Moslem world and the Ottoman Empire. This is why Persian cuisine still endures today with a warm familiarity, despite its alluringly exotic air. The primary food in classical Persian cuisine is rice. Delicately prepared with herbs and nuts, sumptuous rice dishes are served in as- sorted variations. Another principle element is yogurt. This ingredient is used to balance the cooking, in preparing desserts, for marinating or is even mixed with water to provide a refreshing drink. Tea, served from a Samovar completes the traditional Iranian meals. bean & very special spice vegetables Khoreshte bademjan: Eggplant, meat ball or meat slices, tomato sauce & rice Khoreshte Kadoo: Pumpkin, tomato sauce, meat slices, spices &rice Chelokabab: Rice and long Roast meat (the most popular food in IRAN) Bakhteyaree barbecue spit: Slices of fried meat & chicken cooked in spit Lobiapolo: Meat, rice, peas & tomato sauce Gheymeh: Meat, rice potato chips, peas & tomato sauce Maheepolo: Rice & Fish. “Culture IRAN has witness more than ten thousand years of history. It is a land of astonishing cultural diversity, processing several world heritage sites and offering excellent museums to help bring its rich past alive. Traveling through IRAN, you experience the legacy of this great country everywhere you go. Especially Shiraz & Isfahan, because of its unmatched beauty & historic ambiance Isfahan is called “Half of the world’ as dubbed for the first time by French poet Reiner who visited this city in the 16th century. The land of IRAN, located in the forked road of the east and the west: Central Asia, Turkey and the Arab countries, is part of the Silk Road. This connection still exists via air and land. In additions to goods exchange, cultural contacts, acquaintance with surroundings and ways of living that are different from the west are all made possible through these routes.